Made in Coventry, West Midlands, England, United Kingdom, Europe, c 1885. 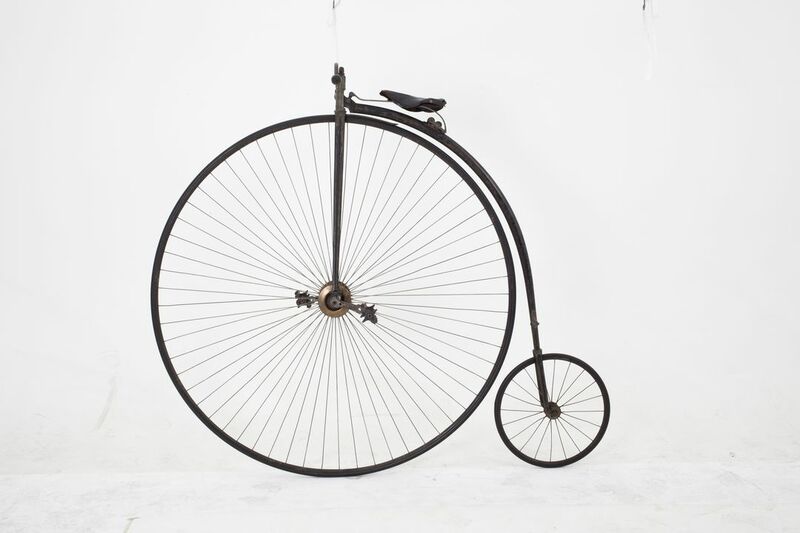 From 1870 to 1885, the penny farthing had a brief, but visually lasting, effect on the development of the bicycle with its very large and distinctive front driven wheel and small rear wheel. It was called a penny farthing after two British coins of the period, the large penny and the much smaller farthing, worth a quarter of a penny. This type of bicycle was variously described as an ordinary, a high wheeler, and a penny farthing; the last of these names is best known today. This bicycle, number 19018 by Singer, has a tubular frame with a backbone of weldless steel, a rear step, slotted cranks, fluted front and rear forks, solid rubber tyres and radial spoked wheels. The leather seat is not sprung. The dropped handle bars have wooden grips. The paintwork is black and some of this original colour and white detail line work remain. There are traces of black paint with white detail on the rim but they are now largely rusted. At one time the handle bars, vertical section of the front forks, the entire pedal assembly and the spokes and axles of both wheels would have been nickel plated. The back wheel was originally red solid rubber. The pedals are thought to be of the era but are possibly not original Singer ones. The bicycle is missing the brake lever, front brake mechanism and saddle cover. On rear wheel hub: "Patent / 3531 / 1877"
On front wheel hub: 19018 / 54. The cover plates on the rear wheels are marked: "VXXI" and "VXX". The bicycle is said to have been used by Mr Thomas Wearne of Bonnyrigg, NSW, in the 1880s. Thomas Wearne (1834-1914) was born in Ponsanooth, Cornwall, England, and emigrated with his parents at the age of 13. He arrived in Sydney in 1849 on board the ship 'Harbinger'. Thomas was apprenticed to a tinplate manufacturer for 7 years. He went on to become an ironworker and established his own foundry in Sussex Street, Sydney, and from 1878 ran an engineering works, the Glebe Foundry, at 46-80 Cowper Street, Glebe. His firm made tram and railway rolling stock as well as bridge parts. In 1878 Thomas won a contract to supply 25 steam goods locomotives but after finishing two he suffered from bank foreclosures and lost the contract. During the 1880s Thomas lived at 'Elizabeth Cottage', 123 Derwent Street, Forest Lodge. By the time of his death in 1914 he was living at 'The Cedar', Wearne Road, Bonnyrigg, now a south western suburb of Sydney. The penny farthing was donated to the Museum in 1951 by Mr P. H. Bullock of Cabramatta. Lyons, Mark, 'Wearne, Thomas (1835 - 1914)', "Australian Dictionary of Biography", Volume 6, Melbourne University Press, 1976, pp 369-370.